Even though my primary focus when I started this blog was family health, with a huge emphasis on kids’ health, I’ve been wanting to shift some attention to mamas recently. 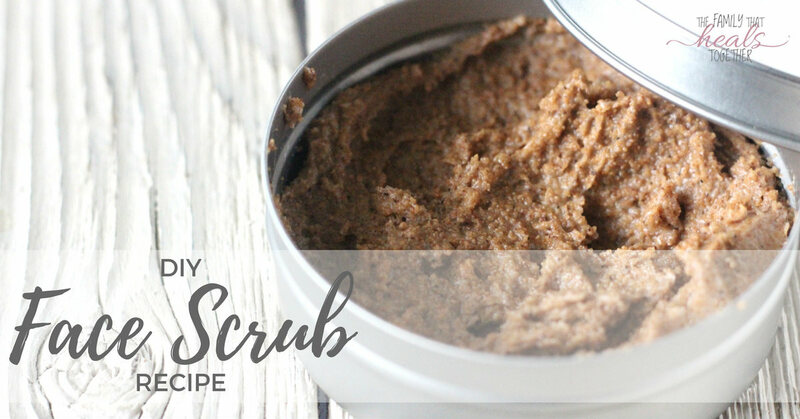 We’ve been talking about hormones and ways we can take care of ourselves, so I thought sharing this DIY face scrub recipe was a perfect fit. My DIY face scrub recipe! I’ve always been obsessed with scrubbing my face. I don’t know why. I guess it seems as though life tends to build up on your face, ya know? Like, toxins in the air… garden dirt… cosmetics… the boogers my two-year-old tries to feed me to wake me up. So scrubbing my face always makes me feel like I’m getting rid of the build up of every day life. Aside from the obvious reasons above, did you know you should scrub your face regularly for skin health? Exfoliating helps to unclog pores and prevent blemishes, while also removing dead skin cells that are ready to be sloughed off. Our skin is continuously regenerating itself, and helping it along with an occasional exfoliation can help to turn over fresh, new skin more quickly. When I worked as an aesthetician, I loved doing microdermabrasion on myself, but these days, both lack of time and the chemical exposure make that a bad choice. I’ve recently been using a natural walnut shell scrub I really like, but a perusal of the label revealed less-than-perfect ingredients. 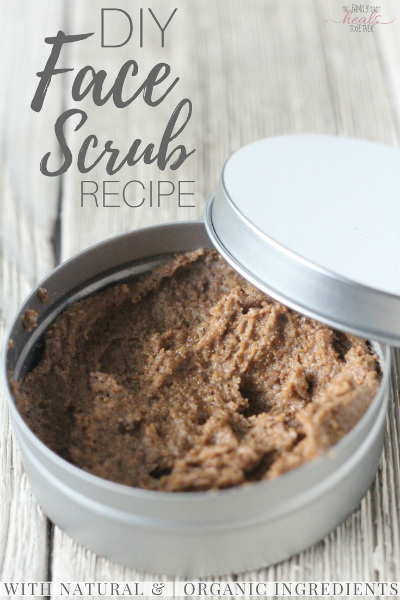 It made perfect sense to make a DIY face scrub, and seemed like it would be easy enough. It was. I already had some of the ingredients I wanted to use on hand, the others I grabbed easily and inexpensively via Amazon Prime (how did we live before Amazon Prime?). Note: while this recipe is good for giving your face a good scrub, you wouldn’t want to use it on your delicate eye area. Use a homemade eye makeup remover for that! Ground walnut shells- totally natural with no added ingredients, ground walnut shells are perfect for sloughing away dead skin cells. Get it here. Organic oils- apricot kernel oil, calendula oil, and jojoba oil are all excellent for nourishing the skin. They have anti-aging and moisturizing properties. Get apricot kernel oil here, calendula oil here, and jojoba oil here. Emulsifying wax- to give this scrub a little softer, creamier texture, rather than become too thick, I wanted to add a little water. Emulsifying wax is necessary to emulsify the water with the oils. Get it here. Castile soap- using just a little of this pure, gentle soap helps to give the scrub a little extra cleansing power. I used Dr. Bronner’s in citrus scent to compliment the essential oils, which you can grab here. Essential oils- not only do the essential oils provide a nice aromatherapy touch, but grapefruit essential oil is a popular oil for skin care because it is a natural anti-bacterial that can help fight acne. It also helps to bring balance to the skin’s natural oils. Likewise, rosemary essential oil is a natural anti-microbial. Get grapefruit essential oil here and rosemary essential oil here. NOTE: citrus essential oils may make the skin sensitive to sunlight, so you may want to avoid direct sunlight for 12 hours following use of this DIY face scrub. Please also note that frequent dipping on your fingertip (especially a wet fingertip!) into the scrub may result in spoilage. To avoid this, I suggest you use a clean utensil of some kind to scoop it out, or consider adding Vitamin E oil like this (a preservative antioxidant), OR store it in your refrigerator (a pain, I know). Also- be sure to choose safe, non-toxic containers for DIY skincare recipes! In a small bowl, combine ground walnut shell and castile soap and stir. In a small saucepan, combine oils and emulsifying wax and heat over low heat until emulsifying wax is melted. Add hot water to oil mixture and whisk to combine and create an emulsion. Add walnut shell mixture and essential oils to emulsion and stir until combined. Store in a jar with an air-tight container. Use about 1/2- 1 tsp and, gently using your fingertips, scrub in a circular motion over your face to exfoliate weekly. Do you have a DIY-obsessed friend who’d love this DIY face scrub recipe? Share using one of our links!